Extremely high full load and part load energy efficiency leads to extremely low operation cost. Low operating sound with no intrusive low-frequency noise, creates a better working/living environment. Environment sound refrigerant HFC-134a of zero ozone depletion potential. Easy and fast installation to reduce on-site installation time. 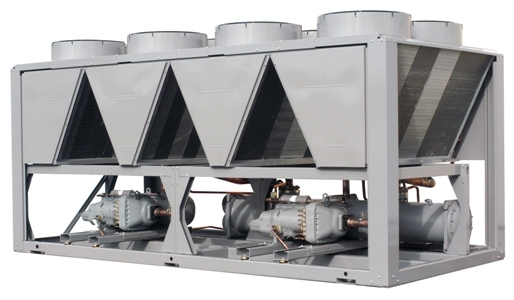 Exceptional endurance tests ensure superior reliability to minimize chiller down-time. - New twin-rotor screw compressor equipped with a high efficiency motor and a variable capacity valve that permits exact matching of the cooling capacity to the load. - Flooded multi-pipe evaporator to increase the heat exchange efficiency, configured with aluminium cladding (standard) to improve thermal insulation and prevent energy loss. - Electronic expansion device allows operation at a lower condensing pressure and improved utilization of the evaporator heat exchange surface (superheat control). - Economizer system with electronic expansion device to achieve enhanced cooling capacity and efficiency. - Average COP of 3.2 at nominal conditions and average integrated part load value (IPLV) of 4.4. - Discharge dampers integrated in the oil separator (Carrier patent). - Silencer on the evaporator return line. - Acoustic compressor and oil separator enclosure (option) reduce the radiated noise. - Condenser coils in V-shape with an open angle, allows quieter air flow across the coil. - Low-noise Flying Bird fans (Carrier patent) enjoy quieter operation and never generate intrusive low frequency noise. - Rigid fan mounting preventing start-up noise (Carrier patent). - Refrigerant of the HFC group with zero ozone depletion potential. - Reduction of leaks as no capillary tubes and flare connections are used. - Verification of pressure transducers and temperature sensors without transferring refrigerant charge. - Industrial-type screw compressors with oversized bearings and motor cooled by suction gas. - All compressor components are easily accessible on site minimizing down-time. - Electronic motor protection against overloads and power supply faults (loss of phase, phase reversal). - Thermal insulation with aluminum cladding for perfect resistance against outside aggression(mechanical and UV protection). - Partnerships with specialized laboratories and use of limit simulation tools (finite element calculation) for the design of critical components. - Transport simulation test in the laboratory on a vibrating table. The test is based on a military standard and equivalent to 4000 km by truck. - Salt mist corrosion resistance test in the laboratory for increased corrosion resistance.